In Wade’s final season, the Heat (at the time of this writing) stand in sixth place in the Eastern conference, and while they lead in their division, they sport a record barely over .500. Which means they will not have home court advantage in the first round of the playoffs and will most certainly be dispatched – again – without at least making it to the conference semifinals for the fourth time in the last five years. I’m not sure that’s what D-Wade had in mind when he signed up for his “Last Dance” tour, but it appears this season is headed in the same direction of the previous four, non-Lebron years, which means an early exit in the playoffs. It’s not as if the Heat hasn’t tried to obtain better players, but the NBA is most assuredly a star-driven league – which means you’re either a have or havenot. And the home team is definitely in the latter category this year. But at least the Heat make the playoffs, which is more than one can say for the other winter sports tenant we have down here, the Florida Panthers. You see in the NHL, 16 out of 31 teams make the playoffs, which makes the odds of getting in slightly better than 50%. Yet in their 24-year history, the Panthers have made the playoffs only five times; that’s right, five. And this in a league where you have a better than even money chance of playing post-season hockey. Their last post-season series win? Well, let’s just say if you’re old enough to drink legally (in all 50 states), you still trail the Cats post-season futility. Bill Clinton was president and “Macarena” was a huge hit. The year? 1996. 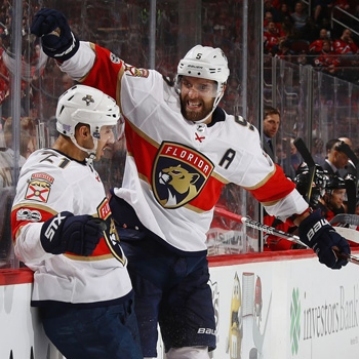 As of this writing, the Panthers are mired deep in the belly of the Eastern conference with little reason to believe they will climb out of the cellar. Not very encouraging, right? I know, but at least keep this thought in mind: There are other places where the pickings are even slimmer. Where 25-year olds have never known the satisfaction of a playoff win, despite their hometown hosting all four major professional sports. At least we’re not Detroit.